At Dadtography.com, we love working with brands! We're a PR-friendly community of "Dadtographers" that understands how discussions about products and services can be woven into everyday life in a meaningful and un-obtrusive way. We partner with brands that "get" that as well. We love working with brands to produce high-quality, custom & authentic branded content. Are we a good fit for your brand? Dadtography.com is a family-friendly website focusing on discussions about being a parent, raising children (of all ages) and the challenges of the family dynamic. We try to tell our stories visually - through photography and video, so we love talking about the technology and products in those spaces as well! What's your role within the company? Do You Have an Affiliate Opportunity? Are you a brand or marketer with an active affiliate program? If you think your program would be a good fit for us, let us know! Our existing affiliate programs have conversion rates (click-to-sale) of up to 40%. We love working with brands that value quality content and authentic experiences. Want to learn more about Dadtography.com, our metrics, philosophy and more? Download our press kit to learn all about us. We've worked with some pretty cool brands. As a Dadtography.com brand partner, you will be working with a content team that's worked with some pretty cool brands on some fantastic projects in the past. Here's just a bit more information about what we've done so far. We've worked with brands to create true-to-life, candid and real photography for their campaigns. Video performs very well. You know this and so do brands. We've created authentic video with brands to contribute to their marketing goals. Copy is not dead, and it likely won't ever be, either. 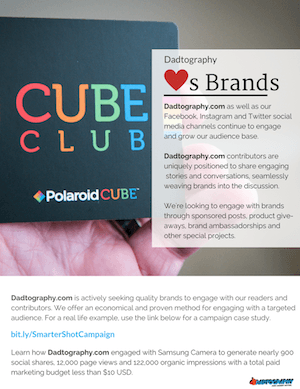 We've worked with brands to contribute to their content marketing campaigns. Social media is all the rage, but it's not just a fad. We've worked with brands to create shareable content for social media channels. We were hosted by The Grove Resort Orlando for a family staycation waterpark adventure. We partnered with Samsung on a custom "Smarter Shot" campaign for its NX camera line. We partnered with Polaroid on a campaign for the Polaroid Cube. We worked with Olympus on their PEN E-PM1 camera release. We worked with NASCAR on the launch of their Acceleration Nation app. We hosted a Twitter party with Kia on a "big game" promotional launch for their Optima launch. We participated in a press trip with GMC on their GMC Terrain. We helped DC with the launch of their Superhero Girls cartoon. We did a holiday travel campaign with Choice Hotels. We partnered with Best Buy on the promotion of a Father's Day GearVR campaign. We helped Amazon with the launch of their Amazon Prints. Dadtography partnered with the Publix supermarket brand on an Instagram campaign. We'd love to partner with your family-friendly company. If your brand, product or service caters to parents (not just dads) or contributes to visual discussions parents and families have every day then we'd love to hear from you! Please fill out our contact form below and tell us all about yourself!